If we receive your order before 12 noon we will do our best to get it delivered to you the next working day. 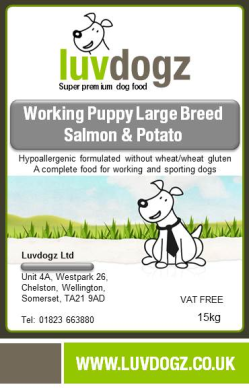 Salmon 24%, Potato (15%), Salmon Meal (11%), Potato Protein (11%), Barley, Oats, Sugar Beet Pulp, Poultry Fat, Peas, Salmon Digest, Salmon Oil, Minerals, Vitamins. Great Value with high levels of Chicken & Rice! Delicious Grain Free Recipe for Senior Dogs with added Joint Health! VAT Free Bulk Buy Quality Working Dog Kibble!